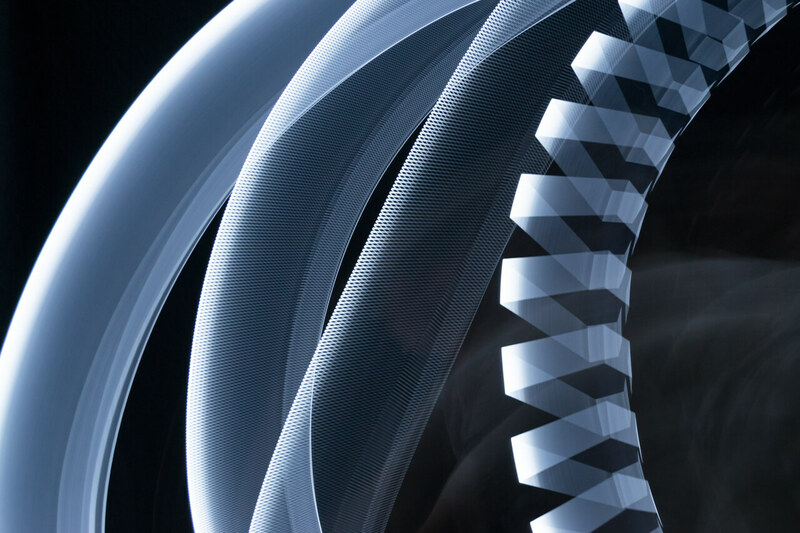 Whether we like to admit it or not, many light painters have purchased cheap zoom lights at some point, before we knew any better. 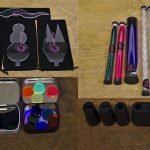 There is no question that it is possible to light paint with very cheap flashlights, but how do these cheap zoom lights compete with higher quality budget flashlights when it comes to value for money? 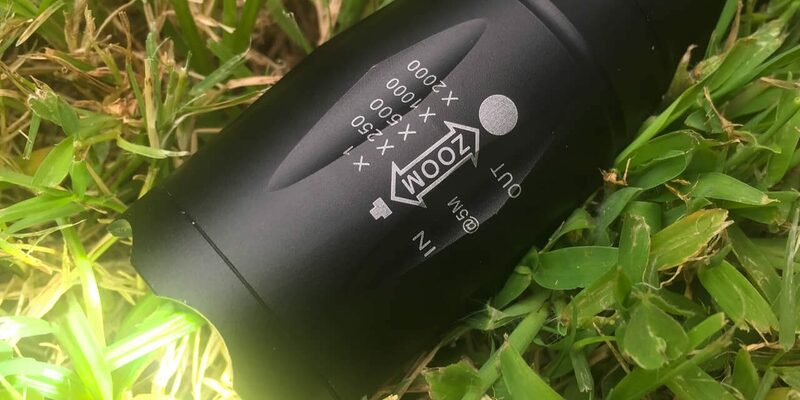 There are many cheap zoom lights available, and the one chosen for this review is produced by a Chinese OEM manufacturer, and is available under lots of different brand names (half of which end with “fire” or “tac”). This model is easily identified by the zoom markings on the head. It is available through Amazon, eBay, various Chinese electronics retailers, some bricks and mortar stores, and even some home shopping channels. Prices range from US$2 through to more than US$50. This one is claimed to have 1600 lumens, with sellers typically claiming 1200 to 3000 lumens for this 18650 or 3xAAA powered light. 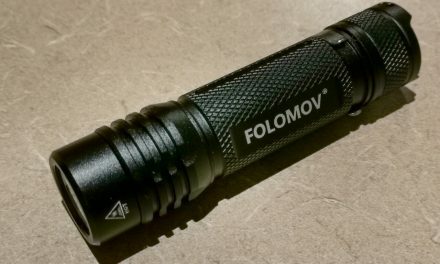 I have even seen a claim of 100,000 lumens, and multiple examples of retailers claiming it to be “the world’s brightest flashlight”, “military grade”, and “so bright it might be banned”. Hmmm. As with most cheap zoom lights, this light has an aspheric lens. 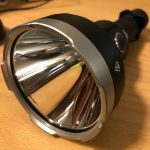 Aspheric lenses are not as good as TIR lenses as found on more expensive Coast, Ledlenser, and Walther Pro zoom flashlights. This is due to around 50% of lumens being lost within the head of an aspheric light when it is zoomed. The zoom mechanism can be moved in-out with one hand, and is fairly smooth. Unfortunately the zoom mechanism is quite loose and can annoyingly slide during light painting. There is a single reverse clicky switch on the tail of the light. The LED is advertised as an XM-L2 T6, which is a product name of a Cree LED. However, the “fake” LED emitter in this light is not made by Cree, being made by a company called Lattice Bright. This has been tested by flashlight enthusiasts to have considerably less efficiency than a genuine Cree LED at the same voltage and current, as well as having more blue light in the spectrum. This LED may also degrade faster over time. Construction quality is somewhat average. I’ve come across worse cheap zoom lights. It certainly survived being shipped with minimal padding, and what appeared to be an incident with a herd of elephants during transit. However, this light is a long way from being “military grade”. The light’s tube fits either an 18650 battery, or a battery carrier that can fit 3xAAA batteries. There is a tube to stop 18650s from rattling around inside, but is it far too wide for even the most obese protected 18650 batteries I own. There are prongs or springs at both ends of the battery tube that allow for flat or button top batteries. Given the average construction I would only use protected 18650 batteries in case of risk of an electrical short. As the threads are not anodised, it is not possible to lock out the light out for safety by turning the tail cap. A tap will advance through the modes faster. Within 10 seconds of being off, there is a next mode memory. After 10 seconds of being off, the light resets back to being in high mode. There is disappointingly no (same) mode memory, so you cannot directly access the lower modes or strobe from off. This limits the usefulness of this light for light painting, which is a shame as the strobe is an increasingly rare single frequency strobe. There is also no momentary (forward clicky) functionality, which means less control over when the light is on and off. As this is a zoom light, the beam ranges from a wide angle with a reasonably even beam, to a narrow zoomed beam projecting an image of the LED. 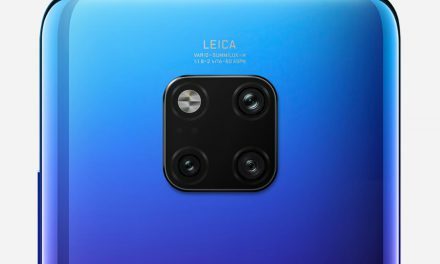 The wide angle beam is a similar angle to the Ledlenser P7.2, and has an even beam with no hotspot. This is useful for even (but very dim) illumination of light blades. 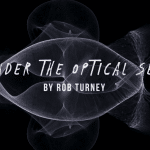 The wide angle beam would be useful for the even illumination of objects if it wasn’t for the poor tint and CRI. In zoom mode, the LED is projected which appears quite ugly (rather being out of focus on TIR based zoom lights), and there is quite a lot of beam ring artefact. Due to the small LED projection, the measured peak beam intensity is surprisingly high compared to some non-zoom 18650 budget lights. 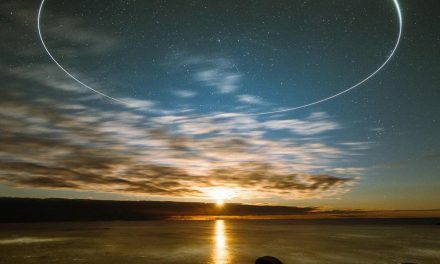 However, at full zoom this hotspot is too narrow to adequately illuminate longer light painting tools such as tubes and swords. I preferred to move the zoom slightly back from full zoom for a more even out of focus beam, which lowers that peak beam intensity significantly. The comparison image with a US$20 Convoy S2+ Desert Tan/Sandy Brown flashlight shows how dim this light is compared to a decent budget 18650 tube light. In fact there is at least a 4 stop advantage from the Convoy S2+ in photographic exposure compared to this light. This means that the Generic Cheap Zoom Light is difficult to use in brighter ambient light conditions, such as around street lighting. In low ambient light situations a very wide aperture and/or high ISO is required for decent results. 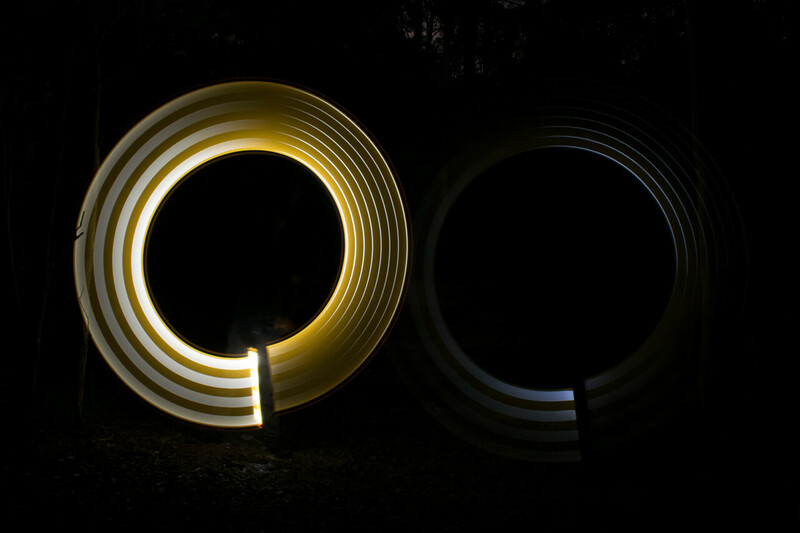 Light painting using a Convoy S2+ (Left) vs Generic Cheap Zoom Light (Right). Both lights on 100% power. ISO100, f/8. Note: approximately 50% of lumens are lost when the light is zoomed. The modes are rather strange in that there is not a huge amount of variation in brightness between modes. The output appears to decline slowly with runtime and reducing battery voltage. 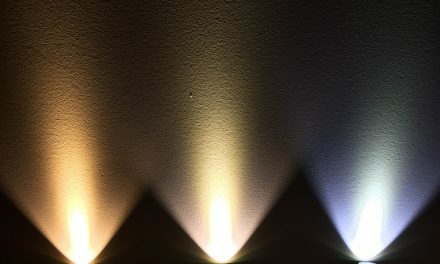 Due to the low lumens and thus low heat production, the light does not need to step-down brightness after a few minutes, which occurs in many brighter lights. 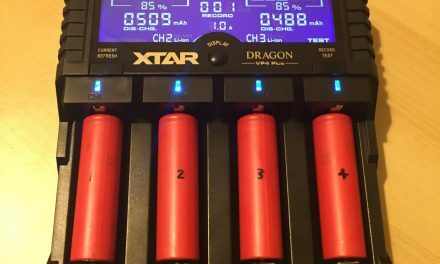 Using an 18650 battery I found that it took around 10 minutes for the output to decrease to that of 3xAAA (230lm). Using 3xAAA it took 1 hour for the light to reduce to around 50% of the original brightness, and the light output reduced to just 1lm by 1 hour 20 mins. The runtime should theoretically be x3 to x5 times longer with a decent 18650. Due to the “fake” LED, the tint is very cool white, with a hint of green around the edge. This light made some of my other cool white tint flashlights seem relatively warm. I did not find the tint as bad as some other reviews I’ve read of Lattice Bright LEDs, where an “angry blue” tint has been reported. 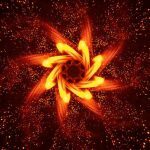 Maybe I was just lucky, or Lattice Bright are investing in research and development? As a result of of the very cool white tint, the Colour Rendering Index (CRI) is poor, and estimated to be far below 70CRI. This low CRI results in objects that are being illuminated to look washed out. PWM was detected in medium and low modes. This will create a stuttering effect on any light trails, which is good or bad depending in the desired artistic outcome. 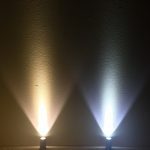 High, Mid, Low, and Strobe modes, connected to a lightblade. ISO400, f5.6. So can I recommend this light? 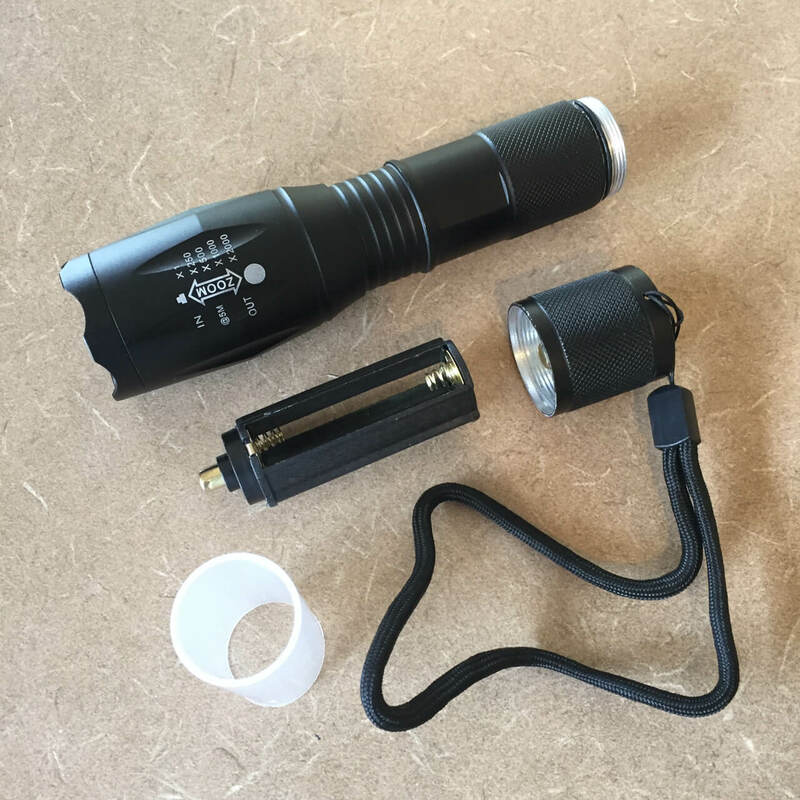 This flashlight has many limitations including no mode memory, no momentary, loose zoom mechanism, and very dim output compared to 18650 tube lights. 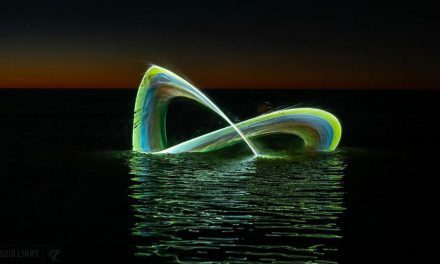 Whilst it is useable for light painting in relatively dark ambient light conditions, a wide aperture and/or high ISO is required to get “professional looking” results with this light. Value for money depends on the type of battery used. If you are using non-rechargeable Alkaline batteries, this light will eat them for breakfast, and will cost you a lot in batteries. 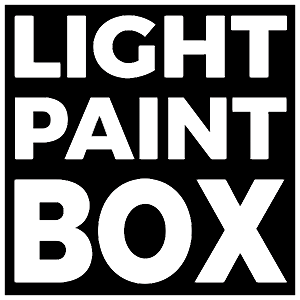 For users new to light painting, who already own rechargeable NiMH AAA batteries and chargers, then this light represents value for money if bought at around $8 or less (such as the Meco branded version from Banggood). 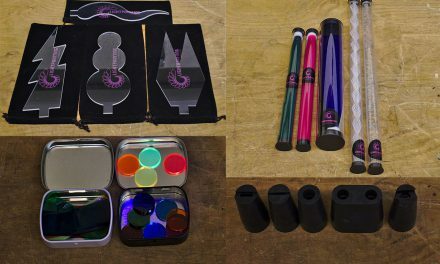 Most quality lights using AAA or AA Alkaline or NiMH batteries such as Ledlenser, Walther Pro, and Coast are relatively expensive compared to this light in terms of cost per lumen (though Coast have reasonable prices in the USA market). There is a lack of decent budget AAA and AA flashlights suitable for light painting, and I would recommend using li-ion flashlights if you want more bang for your buck. For those who already own, or are happy to invest in li-ion batteries and chargers (which have a lower total cost of ownership compared to NiMH or Alkaline batteries), then this light represents very poor value for money. 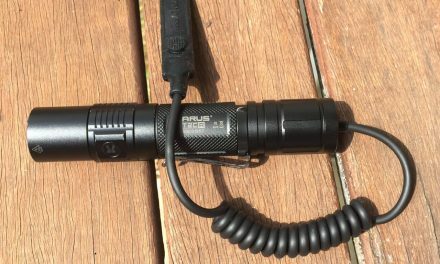 There are some considerably more impressive 18650 flashlights that can be obtained in the US$15-$30 price range from budget manufacturers such as the Convoy S2+, Thorfire TK15S and VG15S, Sofirn SP31, and Atactical/Wowtac A1S. Sometimes it is best to save your money! I would not recommending purchasing cheap zoom lights packaged with included li-ion chargers and batteries, as they are likely to be of dubious quality, with increased risk of fire or explosion.